Open the gate and take the boat into the lock and close the gate behind the boat. Using your windlass open the sluice gate and allow the water to flow from the top pound into the lock. The boat will then rise as the lock fills with water. When the water level inside the lock is the same as the water level ahead in the canal open the top gates and take the boat out. Close both the sluice gate and the lock gate behind you to preserve water. Open the lock gate and take the boat into the lock, remember to close the gate behind the boat. Open the sluice gate with your windlass and allow the water to drain out of the lock. 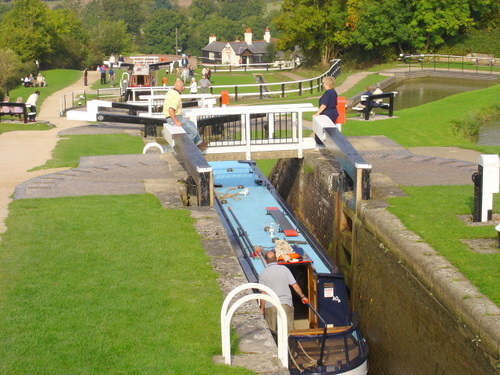 The boat will lower as the water level in the lock drops.When the water level inside the lock is the same as the water level ahead in the canal open the bottom gates and take the boat out. Close both the sluice gate and the lock gate behind you to preserve water. If you are about to go on your first boating holiday and have no idea how to operate a lock don't worry your trainer will explain it all to you and once you get to grips with them locks are all part of the fun of a canal boat holiday. Water will always flow downhill and when the lock gate is closed against the pressure of the water the gate will not open until the water level is equal on both sides. Travelling through a lock will take approximately 10 to 20 minutes depending how big the lock is. It is always nice to meet another boat coming towards you on the approach to a lock as this boat will have just exited the lock on your level and therefore the lock will be set in your favour. Chamber - The main feature of a lock, it is a watertight enclosure which can be sealed off from the pounds at either end by gates. Cill - A ledge inside the lock on which the gates sit. Gates are watertight doors which seal off the chamber from the pounds. Each end of the chamber is equipped with a gate made of oak, elm or steel. Guillotine lock - A lock where the gate is wound upwards like the blade of a guillotine. Lock flights - A series of locks in close enough proximity with a short pound in between. Lock Keepers - Some locks are operated or supervised by professional Lock Keepers, in particularly where locks are large or have complicated features. Pound - The level stretch of water between two locks. Rise - The change in water level effected by the lock. Sluice - Trapdoors which let water in or out and are situated in the lock gate or on the side wall of a lock, are also know as paddles. Staircase Lock - Used when a very steep gradient has to be climbed and where the bottom gates of one is the top gates of the next. Winding gear - The mechanism which allows the Sluice, paddles, to be lifted (opened) or lowered (closed). Windlass - Also know as the lock handle or iron it is a spanner like tool used for opening and closing locks.